alumina ceramic dimple mosaic tiles advantages : light weight, better abrasion resistant with dimples in surface;easily sticked in net, silk and paper. 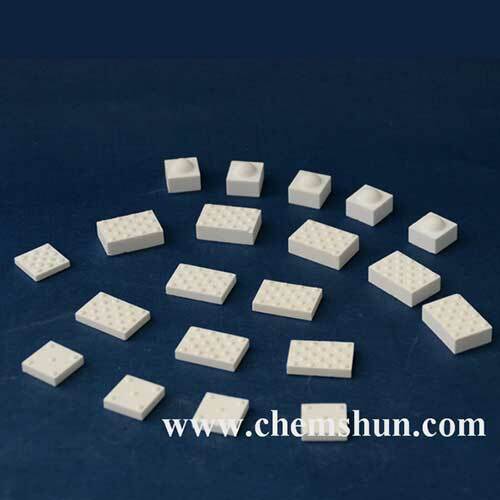 Chemshun Alumina Ceramic Mosaic Tiles are used as lining with advantage of wear-resisting, impact resisting, easy operation, etc., is ideal surface wear-resisting material of material transfer equipment in iron & steel works, thermal & power plants, mine, etc. Trades and can extend operating life of equipment effectively. It is widely used as tile mat lining in conveying engineering to protect the belts in mining industry and agriculture,etc.